As many know, Gros Morne National Park is a UNESCO world heritage site for its spectacular beauty and the wide variety of geological features, often leading the park to be called the “Galapagos of Geology”. The name Gros Morne roughly translates to huge round hill, which refers to the second highest mountain in Newfoundland and the highest peak of the park- Gros Morne mountain. Summit group shot: Carlene, Crystal, Forest and I at the summit of Gros Morne Mountain! Today Crystal, Carlene, Forest, and I decided to hike to the top of the mountain, as only seemed appropriate for visiting the park. The hike up to the summit is a daunting 5 km of a 16 km trail and rises from sea level to 806 m. One of the most difficult parts of the hike is the final 400 m altitude change over a mere kilometer, which is made even more exciting by consisting of solely loose rocky “scree”. Needless to say, it was an intense hike although the trip was well worth it. The top of the mountain consists of a tundra-type ecosystem, complete with rock ptarmigans and arctic hares, both of which we unfortunately did not see. From the top of the mountain the enormous size of the park (1805 km2 or 697 sq mi) could begin to be grasped by the 360 degrees of emerald green beauty. The surrounding mountains, which were once part of the Appalachian chain, were speckled with high altitude ponds, bordered by lakes and fjords, and of course back dropped the ocean. 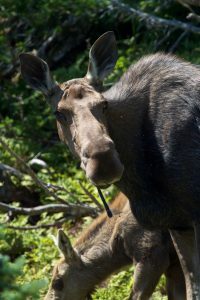 Moose and calf on the descent from the mountain in Gros Morne National Park. The tundra part at the top of the mountain was dominated by insect life ranging from wasps and butterflies to numerous large and speedy spiders. Around one corner during our steep descent Carlene and Forest motioned Crystal and I to be silent and check out the view- a moose and her calf nearly on the trail. Both of which were not very phased by our presence and continued to slowly meander onto and down the path. We did not mind as we had been waiting for a long time to see any moose (especially after seeing our first caribou yesterday). Despite all our excitement today we have a big day tomorrow starting with Crystal being interviewed on CBC Radio Corner Brook at 7:40AM (6:10 EST) followed by servicing all three of our sites and sorting the many creatures we’ve collected! Newfoundland and Labrador’s provincial flower is undoubtedly an intriguing organism, as well as a strikingly relevant one to our work on the BIObus. The flower, Sarrencia purpurea, commonly known as the purple pitcher plant, is immediately striking to the eye when encountered. What catches one’s attention is not necessarily the flower itself, but the peculiarly shaped leaf structures surrounding the base – this is where the purple pitcher plant hosts a unique microcosm of life and receives much of its nutrients. The leaves form a pitcher that collects water wherein various prey items land, get caught, and are processed by a host of microorganisms, enzymes, and very specific insect larva, leading to the ‘carnivorous’ plant categorization enjoyed by Sarrencia purpurea. While the pitcher plant hosts digestive enzymes of its own, the majority of the breaking down of food for nutrient acquisition is done by the organisms hosted within which form the inquiline food web. This is the flower of an individual Sarrencia purpurea that we found at the Berry Hill peat bog collection site in Gros Morne National Park. Alas, our focus on the BIObus this summer is not flowers but insects. Within the ecosystem hosted by the purple pitcher plant’s leaves are often dipteran larvae that hold a commensal relationship with the flower. This dipteran is the mosquito Wyeomyia smithii. Wyeomyia smithii is not a true insectivore in its larval form; while it feeds on the deteriorating pieces of insects caught in the leaves, it also feeds on the population of rotifers, protozoans, midges and bacteria that dwell within the miniature ecosystem. It is considered a keystone predatory species due to its massive impact on the ecosystem that hosts it, as Wyeomyia smithii affects the balance of every other species within based on its presence alone. The unique pitchers that the leaves form on the pitcher plant. The geographic range of this mosquito is intrinsically dependent on the range of Sarrencia purpurea, the most broadly distributed pitcher plant currently known. The range extends across nearly the entire eastern seaboard of the United States and extends over much of Southern and Eastern Canada. The mosquito’s eggs hatch within the pitcher plant’s phytotelmata (the aqueous solution hosted within the leaves) and proceed to develop for approximately 22 days before they emerge to adulthood. The adult form is not the typical pest mosquito you may be accustomed with, as it feeds primarily on nectar, so you won’t be finding it mentioned within the must-read “Best of the biters” post authored by Jill. Once an adult, the mosquito lives for roughly 40 days where it will feed, reproduce, and lay eggs within Newfoundland and Labrador’s provincial flower, and hopefully experience true insect love along the way.